Two years ago I decided I was going to make some homemade vanilla extract to give away for Christmas. I thought it was a good idea....I know I'd love to get a jar of homemade vanilla, so I hope the people I gave it to enjoyed it! Turns out that homemade vanilla has a much better flavor than the store bought stuff, so I am officially committed to never buying vanilla extract again. From my research I discovered that it keeps for an indefinite amount of time. You can just keep adding more alcohol and switch out the vanilla beans once in a while, and it's good forever......well maybe not forever, but you get the idea. Split the vanilla beans the long way with scissors but leave the last inch uncut. Add the beans and the alcohol to a glass container with an airtight lid. Make sure the beans are completely covered with the alcohol. Put in a cupboard out of light and then all you do is wait - I like to wait at least 8 weeks before using it. Adding rum to the mixture will give the extract some sweetness. 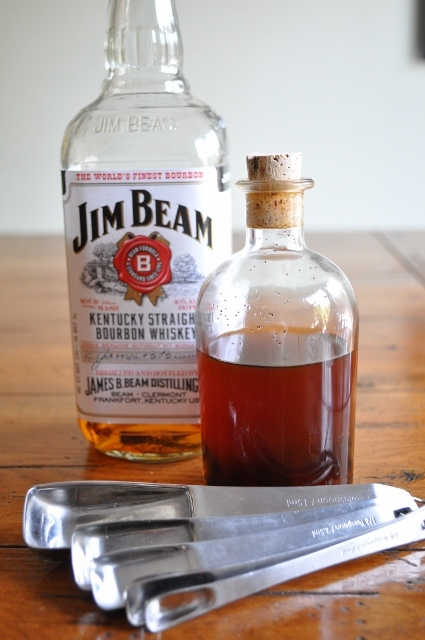 Most store bought varieties add simple syrup to sweeten it, but I prefer adding a little rum. Enjoy!